My friend and I were having a discussion the other day about office temperatures. We discussed how every office where we've ever worked is either too hot or too cold. Since she normally works in government offices, she was wondering if that was always the case in government. I told her it is not just the government. Every place I've ever worked has forced me to deal with extreme temperatures: either too hot or too cold. No office ever has the Goldilock's "just right" temperature. One might ask, "How can this be? How is it possible that no office worker in the world can figure out the thermostat?" The simple truth is, no one can ever agree on the correct temperature. If one person cranks up the heat, the person down the hall is sweating. If another person turns down the heat, yet another co-worker is freezing. There is just no way to please everyone. I've heard arguments that men always prefer cold temperatures and women prefer offices warm. This is not necessarily the case. Sit in a room with a woman with hot flashes for one minute, and you will know some women need the air conditioner cranked up at times, too. This leaves us wondering what are people supposed to do when they are suffering through office temperature woes? Surely, you can't just sit there and freeze or fry. You also can't wear long sleeves in the summer just because the maintenance guys are trying to freeze you at work. You can't wear short sleeves all winter just because someone enjoys cranking the heat up for that "summertime at the beach" feel. So what are some solutions for suffering office workers? The space heater is one of the best inventions ever. It is small, reasonably priced, and hides well under a desk. Obviously, this is the perfect solution to those of us that freeze at our office. What is the problem with space heaters? They are banned from most offices. Yes, how can something so wonderful be banned from a place so frigid? 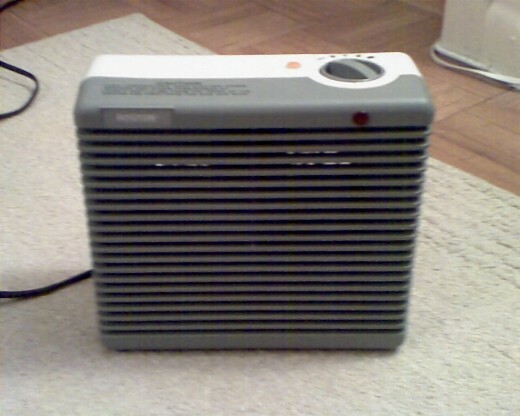 Space heaters are a fire hazard and most offices do not allow them. If a fire inspector comes along and finds a space heater in your office, your employer may have to pay a fine. Of course, how do you carry on at the office if your fingers are too cold to type and maintenance refuses to turn up the heat? You basically have two options: buy a pair of gloves with the finger tips cut out (I know someone who actually did this) or hide that space heater where no one can find it. Gasp! Yes, if you dare go against the rules, you can hide a space heater. My friend admits she cuts off her space heater about 20 minutes before leaving and then hides it in her desk drawer. If it is not plugged in or left on, it is no longer a fire hazard anyway, right? At least, that is what many workers tell themselves every night as they stash away their prized office possession, the space heater. Let's face it, some of us work in offices that give us no privacy. The space heater is not going to work. This is especially the case if you have managers that actually enforce the fire code safety rules. I mean, seriously, imagine following rules and trying to prevent us from burning the office down? Shesh! So if you are no rule breaker, the best item to have for your desk is the "office sweater." The office sweater is something you buy and specifically designate it for your office. You realize the temperatures go up and down, and there is no point in ever taking the sweater home. Most people prefer a nice neutral color for their office sweater, such as tan or black. The office sweater is often hung on the back of a door or the back of a chair, and you can find one in just about any office. The next time you're at work, peak into offices and I guarantee you there will be office sweaters everywhere. Just don't peak too much - that's creepy! If you are tired of wearing the same old office sweater and you'd really like a warmer temperature, your best bet might be the halogen lamp. Fun facts about halogen lamps: 1) they are not banned in offices, and 2) they throw out heat. Oh yes. I said it. One of my co-workers has a halogen floor lamp in his office, and even with the door open, his office is always warm. If you play your cards right, you can even get the office manager to order one for you! Yes, it is amazing! Basically, you have to insist that you cannot see properly at your desk. You should explain how more lighting is necessary to do your job. With that said, you can point out a nice halogen lamp in any Office Depot or Staples catalog. Within no time, you might just have your own halogen lamp. Warmth is coming your way! Let's face it, sometimes it is just too hot at your office. There is really not too much you can do about that either. My recommendation for the overly warm office is to have spare "cool shoes" at the desk. Any shoes you can wear without socks is going to be helpful in that situation. If things get too warm, even in the winter, take off your socks and slide into your "cool shoes." If someone asks why you are wearing sandals in the winter, mention the 100 degree temperature in your office. Maybe they just might look into turning the temperature down rather than looking at your feet in sandals all winter. It is also important to have a small office fan at your desk, too. Small fans are usually around $10 and perfect for the office. They hide easily in drawers or go unseen in a file cabinet. Most offices do not ban fans either. Trust me, when it comes to dealing with co-workers with hot flashes, no one in their right mind is going to approach a lady with a fan running at high speed to ask her to shut it off. No one is that brave or foolish. I hope you've enjoyed this articel about office temperature woes. When it comes to keeping the right temperature at the office, you simply cannot please all of the people all of the time. It is best to take matters into your own hands and come up with some simple solutions. If you have any recommendations, please make sure to share them in the comments.